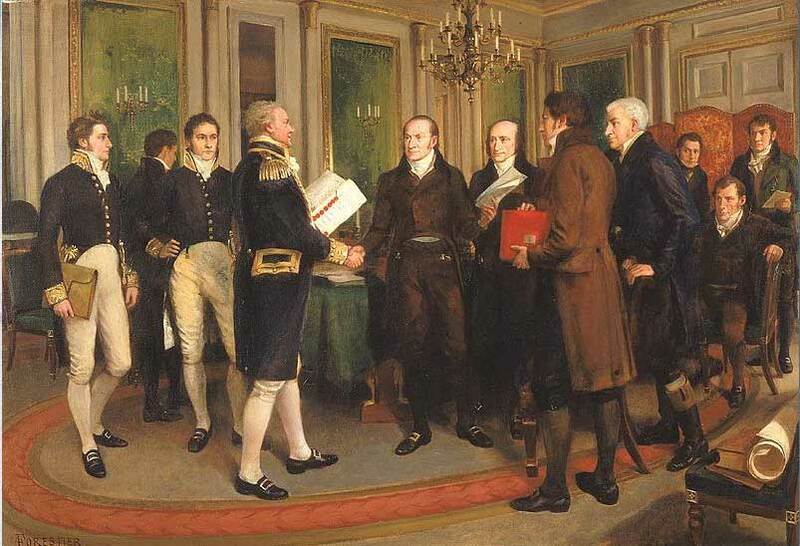 The Treaty of Ghent that ended the War of 1812 was signed on December 24, 1814. The treaty reflected the state of the war, a stalemate. Throughout the war the United States and the British danced around negotiating a settlement, but negotiations never could seem to get going. Finally, in November 1813 the British agreed to open negotiations. The US government agreed to the talks and appointed John Quincy Adams to lead the delegations and included Henry Clay, James Bayard , Albert Gallatin and Jonathan Russell to the American Commission for the talks. It was a high-powered American delegation. The Americans traveled to Ghent which is located in what is now Belgium. Once there they had to wait for the British for four months. The British delegation was made up of William Adams, Admiral Lord Gambier and Henry Goulborne. The British arrived in August 1814 and negotiations began. The Americans began by demanding the British cease the impressment of American sailors, and the British tried getting the Americans to create a Native American buffer nation. But the British refused to discuses the impressment and the American delegation had been instructed to agree to a peace agreement without any reference to impressment. The death of Tecumseh and the implosion of the Indian tribes left the British without any plan for the Indians. After two years of fighting almost no ground had changed hands, the British had failed to seize any significant American land and the Americans had failed to seize any parts of Canada. It was clear the war had been a stalemate and that is what is reflected in the agreement. Under terms of an agreement that was signed at Six O’clock on December 24th any land taken by either side during the war would be returned immediately. Commissions were to appoint to deal with any disputed territorial issues. All prisoners were to be exchanged, and any Indian lands seized were to be returned. The latter provision was ignored. After two years of warfare the two sides ended where they began.